Are you looking for a sophisticated, trustworthy and earth-friendly large hybrid sedan? Then stop by Lipton Toyota and check out the 2016 Toyota Avalon Hybrid. With its quiet and comfortable drive, it’s a well-crafted vehicle that’s full of the latest safety features. The interior showcases a modern arrangement that includes touch-based controls for a clean, high-end look. The inside cabin feature first-rate assets and polished, congruent grains and surfaces. A central touchscreen is now standard. What’s more – 2016 Avalon Hybrid gets incredible gas mileage! 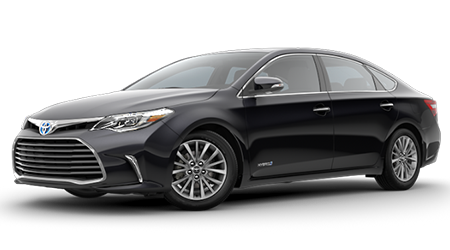 Check out the Toyota Avalon Hybrid and take it for a test drive here at Lipton Toyota in Fort Lauderdale, FL. We especially welcome our neighbors in Dade County and Broward County, FL. The 2016 Toyota Avalon Hybrid stages three trim levels: the Avalon Hybrid XLE Plus, XLE Premium, and Limited models. Across all the trims, you’ll find a relaxing and well-equipped sedan with features that will make your ride feel extravagant. Optional selections for the Avalon Hybrid include the Tech Package with features like a pre-collision system, automatic high beams, and adaptive radar cruise control. Choose the Avalon XLE Premium level and you’ll also get Navigation with Qi wireless charging. The Avalon Hybrid Limited top level contains perforated leather upholstery, a rear sunshade, heated-and-ventilated front seats, HID headlamps, three-zone automatic climate control, LED daytime running lights, heated rear seats. Among the various trims are three audio/infotainment systems. The Avalon Hybrid XLE Plus trim includes the Entune-equipped 7.0-inch touchscreen infotainment system. This system lets you run some apps on the touchscreen, using your data connection through a paired smartphone. The XLE Premium models advance to a 490-watt system with navigation through the Entune App Suite. The premium Avalon Hybrid Limited trim features a 785-watt JBL premium audio system with hard-drive storage. Most of the higher-end standard features are also available as options on lower trims, but obtainability can vary depending on the area where you live in the United States. Stand-alone optional features include an automatically deploying/retracting running boards, sliding rear cargo floor (two-row models only), fixed running boards, roof-rack crossbars. The 2016 Avalon Hybrid functions on a 2.5-liter Atkinson-cycle four-cylinder engine with two motors slipped into the transaxle. They’re run by nickel-metal hydride batteries. Energy is conveyed through Toyota’s reliable environmental power-split continuously variable transmission (CVT). The system generates an astonishing 200 horsepower. It offers three driving modes: EV, Eco, and Sport. The EV allows running on battery power alone at speeds up to 25 miles-per-hour. The Eco mode reduces on the throttle response and HVAC output. The Sports mode sharpens the Avalon Hybrid’s throttle and transmission reaction, so it handles faster, giving you the support to pass or power through a corner turn. And what’s most gratifying about the Avalon Hybrid is the EPA estimated value of 40 miles-per-gallon combined. Toyota engineers borrowed from the Lexus manual to integrate better control and responsiveness into the 2016 Avalon Hybrid. Add-ons to the Avalon include digressive damper valving with larger, all-around stabilizer bars, rebound springs within the shocks, and increased spring rate. The suspension has also been recalibrated for a smoother ride. The Toyota Avalon Hybrid continues to accrue high marks in crash testing. Among many of its top standard safety features: separate rear side thorax airbags, front knee airbags, and backup camera. For even more, step up to the Avalon Limited model that includes adaptive cruise control, a lane departure monitor, forward collision monitor, and automatic headlights. New designing for 2016 Toyota Avalon Hybrid embraces a widened and lower grille so that it flares out. It’s seated in a revised front fascia that includes vertical turn signal slits where the fog lights previously existed. The Toyota Avalon Hybrid offers an unparalleled luxury ride. Quiet, comfortable, and full of high-tech safety features, this large sedan, combines all the fine details and ride handling qualities to make this the ideal drive for those seeking style and modern expertise. What’s more – you’ll save money and help the environment with this eco-friendly sedan. You’ll get superior customer service and a price you can afford when you purchase a handsome, Toyota Avalon Hybrid at Lipton Toyota in Fort Lauderdale, FL. Be one of the first in Dade County or Broward County, FL to own this attractive, eco-friendly, and reliable sedan.